...Sporting facilities and events renamed Accra, Nov. 27, GNA - The Ministry of Education, Youth and Sports (MEYS) has re-named certain sporting facilities and events after distinguished sports men and women in recognition of their contribution to the development of sports in the country. Mr Jake Obetsebi Lamptey Minister of Tourism and Modernisation of the Capital City in a speech he read for Mr Kwadjo Baah-Wiredu, Minister of MEYS, disclosed this at the first ever National Sports Awards held in Accra. The , will now be called "Ohene Djan Sports Stadium, named after Mr Ohene Djan, the first Director of Sports in Ghana who is reputed to had revolutionalised football and sports in general by mooting the idea of the first national soccer league 45 years ago. The Kaneshie Sports Complex would be called "the Azumah Nelson Sports Complex", named after Azumah Nelson, a celebrated Ghanaian boxer. Azumah made impressive performance in the pugilist sport, which saw him as the longest reigning boxing champion in the Super featherweight division. The Cape Coast Sports Stadium has been named after Robert Mensah, one of the greatest goalkeepers in the history of Ghanaian football, whilst the national hockey pitch will now be called "Theodosia Okoh hockey pitch". Madam Theodosia Okoh was a former chairperson of the Ghana Hockey Association, a position, which she held for several years in which she played a great role in the improvement of the sport. 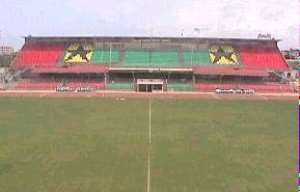 The Sports Hall of the Accra Sports Stadium, will now to be known as "D.G. Hathiramani Hall". Mr Hathiramani is an Indian naturalized Ghanaian who single handedly produced more than 60 percent of Ghana's table tennis team spanning over four decades. The Press Center of the Accra Sports Stadium was named after Mr Kofi Badu, a renowned sports writer whose ideas in the 1950s' mirrored in his write-ups contributed tremendously to the development of football and boxing in Ghana. The newly established Library of the Accra Sports Stadium was named after Mr H.P. Nyamitei was nicknamed the "the grey hair soccer philosopher". Mr Nyamitei who was chairman of the Ghana Football Association (GFA) in 1969, is well remembered for organising a tour for the then famous Brazilian national team which included Arientes dos Nascimentos a.k.a."pele". The Resource Center of the Accra Sports Stadium was named after Mr David Kotei a.k.a. "D.K Poison" while the Stadium Clinic at the Accra Sports Stadium will now be known as "Dr. Yaw Nkansa-Gyane Clinic". Dr Nkansa-Gyane is the former president of the Ghana Olympic Committee. During his tenure of office, he revived the spirit of Olympism in Ghana. The Annual National Athletic Championship is to be known as " Mike Ahey National Athletic Championship". Ahey was a gold medallist in Long Jump at the 1962 Commonwealth Games as well as an African champion in the early 1960s'. The National Annual Boxing Tournament has been named after Roy Ankrah, the first Ghanaian to win a commonwealth championship. He remarkably trained great boxers such as Eddie Blay and Ike Quarter. Mr Obestsebi-Lamptey also announced the establishment of an Annual Table Tennis Championship, which will be named after E.A. Quaye, the former national and African table tennis champion. He said the re-naming process was ongoing and in due course other amenities and events would be named after sports personalities who had significantly contributed to the development of sports in the country.